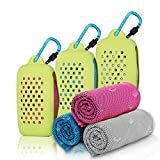 A cooling towel is to help you cool off during periods that you’re perspiring heavily, or when it’s hot outside and you want some way of cooling off besides air conditioning or fans. You wet the towel, wring it out, and “snap” it to get rid of excess water. The water in the towel evaporates, cooling you off. Cooling towels are usually made from microfiber, which absorbs water and wicks it away--the evaporation is what gives the cooling sensation. 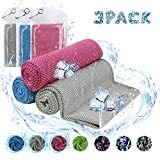 You’ll find cooling towels that are only one type of fabric, or two-layered towels, where one layer is preferred to be in contact with your skin, and the other towards the air, for optimal evaporative cooling. 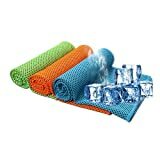 Microfiber towels: These are 90% polyester and 10% nylon towels. They are a moisture- wicking material that remains soft even when dry. It is machine-washable, and offers a sunscreen protection of 50+ UPF. You wet these towels, wring them out, and snap them to expose it to the air. 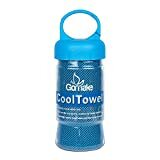 It can stay cool for up to 2.5 hours. Polyvinyl acetate towels (PVA): These are evaporative towels that retain water, while remaining cool. PVA is also called a “manmade sponge”. The Ergodyne Chill-Its 6602 Evaporative Cooling Towel is made from polyvinyl acetate. 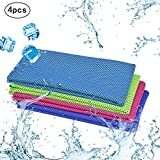 Polymeric crystals: This is not so relevant with cooling towels, but there are cooling bandanas and the like that contain polymeric crystals that absorb water and expand. 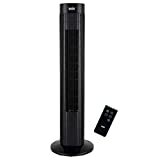 They can keep you cool for an extended period of time. Can be worn in a variety of ways: Depending on the size of the towel, it can be worn as a neck wrap, headband, skull cap, beanie, or face mask (for windy days or dusty environments). Not just for sports people: The large Alfamo towel is large, so it can be tied in a number of ways. You can use it as a cooling bandana or a neck wrap. 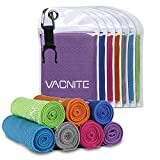 Besides being useful for athletes after a workout, it is also good for gardeners or people working on their lawn or yard, as well as people working in the summer heat, such as construction workers. Don’t store away when moist: The Ergodyne Chill-Its is a PVA towel, which some suggest that you can store it away when still moist, for later use. Some customers said that the material developed a mildew when doing that--so it’s best to dry out the fabric first before packing it away. 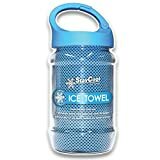 Similarly, the Ice Cooling Towel comes with a plastic storage container--but again, it’s only recommended to store it away when the towel is dry. Size of the towel: The FroggToggs Towel is 33 inches x 13 inches. (For sake of comparison, a bath towel is typically 30 inches x 60 inches, and is large enough to cover the entire body.) The Alfamo is one of the largest, at 40 inches x 12 inches. The larger towel allows you to wear it in different ways. Absorption ability: A PVA towel can absorb eight times its weight in water. As long as the towel is wet, it will manage to keep you cool. 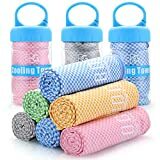 Good for various medical conditions: People who suffer from multiple sclerosis say that they suffer intolerably during hot weather--but a cooling towel is an effective treatment. Women who suffer from hot flashes also notice considerable relief with a cooling towel. It can also help reduce inflammation, in the event of a sprain. You can also apply it as a compress, for someone suffering from a fever. Ergodyne--was founded in 1983, making work gear: gloves, knee pads, high-visibility apparel, protective gear and more. They also have products to whisk away perspiration: gloves, sweatbands, headbands, wristbands, hats and caps. They also make absorption, evaporation, phase change, and hydration gear. Alfamo--makes a cooling towel for sports and fitness training. Their towel is 40" long and 12" wide. It is made of a highly evaporative material, which cools you off when the material is soaked in water. The material is also soft and pliable, unlike other cooling towels that become stiff when they dry out. Frogg Toggs--is located in Arab, Alabama, and are makers of outerwear that is lightweight and breathable. They make waders, hippers, wading boots, cooling towels, wristbands and bandanas. They have rain jackets, suits and footwear for men, women and youth. Mission Athletecare--is a company specializing in athletic care goods. 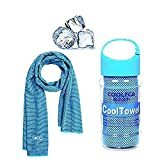 They are makers of gloves, scarves, caps, neck gaiters, headbands, footwarmers, shirts, tights, and cooling towels. 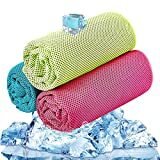 Their cooling towel is a microfiber towel (90% polyester, 10% nylon) that absorbs moisture and perspiration. The fabric then whisks off the moisture by evaporation, giving it a cooling effect. Their towel will get down to 30 degrees Fahrenheit below your average body temperature, for as much as 2 hours.